Common Errors in Rescheck Desktop Rescheck Web | $79 RESchecks & Manual Js. $79 Any Plan. Any State. Some of the most common questions we hear everyday on the Reschexpert blog is about certain errors that arise within Rescheck Web and Rescheck Desktop softwares for Rescheck do it yourself Rescheck creation. 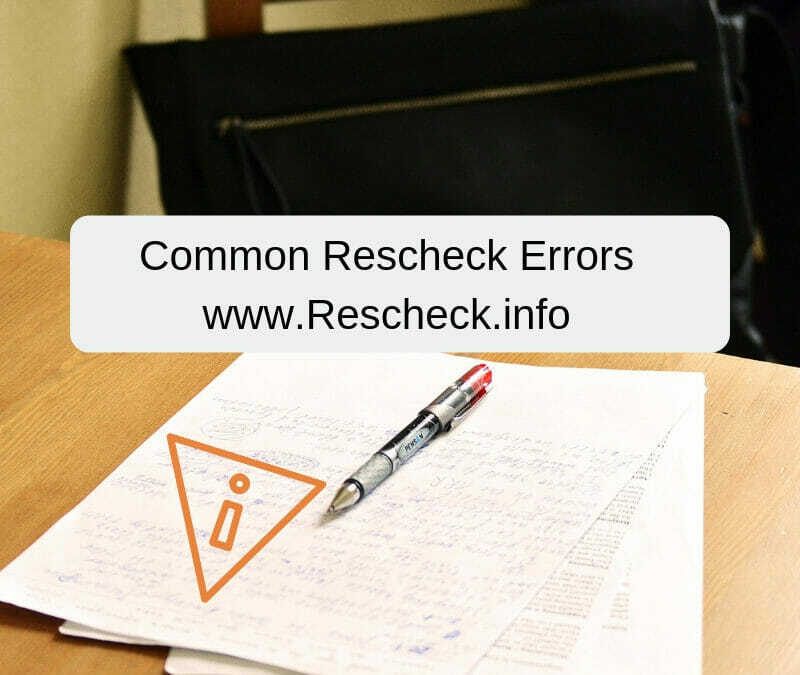 Today we want to discuss the most common errors and ways that you might be able to successfully maneuver around them on your own using a little bit of shared knowledge from Rescheck.info and the Reschexpert blog. The number one error we see is in the Rescheck web software. A Rescheck report will get frozen mid calculation and you will then reload the page a realize that all your Rescheck data is now missing. You can solve this issue by a couple of steps. Your first fail safe is to print off a full size set of plans for creating your Rescheck. We do so on every project. Then copy all your project data on to the plan. This acts as backup file after the Rescheck is created and if the software pukes on your project and deletes your construction data you have a paper copy to transcribe the original data from without having to go back and recalculate. Also to work around this freezing issue you need to understand your internet speed. Rescheck Web software is doing many complex calculations over the web so the more wifi connected items you can turn off (cell phone, Alexa, Google Home, auxillary laptops) the faster your internet speeds should be for the device generating your Rescheck Compliance Report and Certificate. This is the number one way to make your Rescheck Web experience better and will solve 99% of your freeze issues within Rescheck Web. If your internet is still too slow then the other workaround would be to go ahead and download Rescheck Desktop to your computer and work on the non-internet connected version for seemless Rescheck reporting. The second error we see quite often is that the Rescheck will not pass, fail, or proceed and it seems that the software is stuck. In this instance we follow a simple procedure. We look for any item on the Rescheck software screen that has highlighted itself red. We then address that issue. Next we look in the lowest grey box on the left hand side of the Rescheck software. Many times Rescheck software will provide you with an error message inside the Rescheck dashboard. It might ask you to verify a checkbox on the homescreen or too look in your upper menu section of the Rescheck Software and check a specific value. The great thing about this error is that software usually will show you an easy way to fix it and move on with your Rescheck calculation. The key to solving it is too look around for clues. First look for red items, then look in the message box and you should be back on your way to completing your Rescheck. A third error we see is that your city is not listed in the Rescheck software. In this instance it can be a little more difficult, but you still have a few options to get your Rescheck completed. First if you are using Rescheck Desktop and your city is not in the software then log on to Rescheck Web and see if it is in there. If you are using Rescheck Web check Rescheck Desktop. Different versions include different cities so a quick look at an alternative Rescheck Creation software might help you get your Rescheck back on track. If that does now work you can use a town nearby your project locaton. The problem with this lies in the fact that some building inspectors will not accept a neighboring town’s name on their Rescheck report. While we find this disconcerting we also recognize that they hold the authority and if they want to see their specific town’s name on the Rescheck then it will be hard to get a permit without it. Your next step is to dig a little deeper and find older versions of Rescheck Desktop software that include the town. The easiest way to do this would be to call the building inspector and ask him to send an example of the most Rescheck that they approved within their department. At the top of the Rescheck it will tell you exactly which version of the Rescheck software that was used and you can download that specific version and move forward. We sincerely appreciate the plethora of questions we receive everyday on the Reschexpert blog and we will work hard to address them for you in each version of the Reschexpert blog. If for some reason you are getting an error on your Rescheck and have ran out of time to create the Rescheck yourself we offer a low cost ($79) Rescheck service. We can create your Rescheck in 4-6 hours and have it back to you on the very same day. All you need to do is email your plans and a jobsite address to [email protected] and we will take the puck from their. Give us a try today.